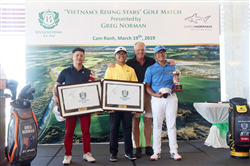 Vietnam’s Sports & Tourism Ambassador and KN Golf Links course designer, Mr Greg Norman made a flying visit to his newest signature course yesterday to launch his inaugural “Vietnam’s Rising Stars’ Golf Match presented by Greg Norman. Hosted by KN Golf Links, this was the beginning of what will be an annual series to promote the game of golf to the younger generations within Vietnam and help to produce a sustainable platform for the growth of the game in the country. Three of the country’s promising young players were invited to play KN Golf Links with Mr. Norman. Providing them with an opportunity to observe one of the games greats, while being given advice on all facets of the game, ranging from the swing, course strategy, practice ethics to the difference in playing conditions across the globe.